You've certainly heard the word "server." It's a type of computer that generally provides or manages services. For example, this website is hosted on a web server, a computer running specific software that can respond to browser requests and send web pages to users anywhere on the internet. You send email through a mail server, a computer with software that routes email to and from your account. And a file server is a computer set up as a receptacle for files, so other users can connect to it and copy files to and from it. A server is nothing more than a standard computer; what differentiates it from a "client" computer—such as the one you're working on—is its software and its ability to receive and process connections and requests. 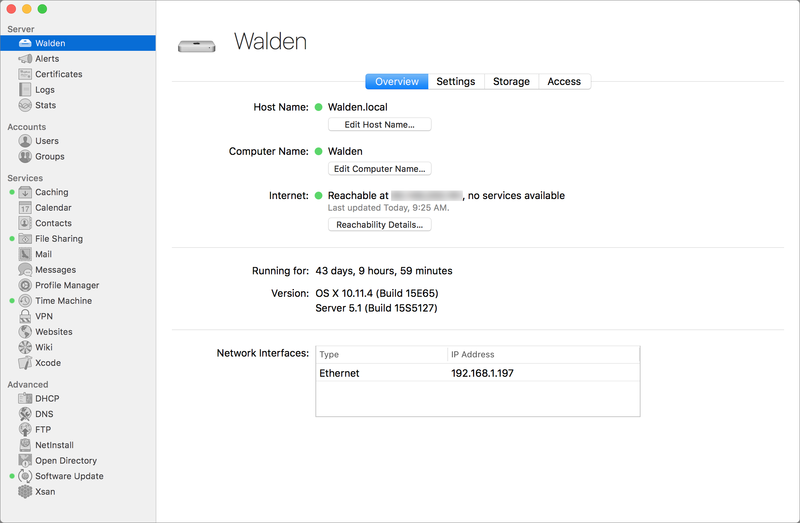 You may not realize it, but your Mac is a server too. It contains all the software you need to host websites, manage email, serve files, and much more. All you need to do is turn on these "services." Apple makes this really easy; you can buy the OS X Server app (for $20) from the Mac App Store, and tweak a few settings, and then turn your Mac into a server in minutes. OS X Server runs on any Mac that runs El Capitan, even an old Mac. 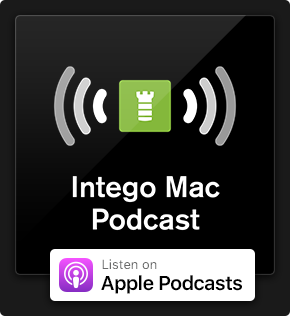 Most users don't need a server, but I'm going to explain a few reasons why you might want to bring an old Mac to life with OS X Server. You don't need a fast Mac for these tasks; I use a five-year old Mac mini as my server (the only requirement is that it be able to run El Capitan and have at least 2 GB RAM). It's inexpensive, easy to set up, and offers a lot of advantages. Start by purchasing the OS X Server app from the Mac App Store. When you've downloaded it to your old Mac, launch the app and follow its instructions. You'll need to choose a name for the server, and you'll be asked to enter your Apple ID and password to use certain services. Server will take a couple of minutes to do its duties, then it'll be ready. You'll notice that Server is an app. You use this app to configure, manage, and control services. You'll want to install it on your server to manage that computer, but you may also want to install it on another Mac, the one you use everyday. You can run your OS X server "headless," without a monitor, keyboard, or mouse, and control it, using the Server app, from another Mac. If you want to work with a headless server, try now, from your other Mac, to connect to your server. Open the Server app, and see if your server is listed. 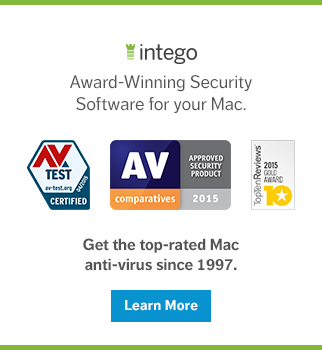 If not, try clicking "Other Mac" and entering its host name, in the form name.local. So if you named your server MyServer, you would enter MyServer.local. You'll use the same user name and password that was already set up on that Mac to authenticate. When the Server app opens, you'll see an Overview screen, along with a lot of options in the sidebar. This service lets your server keep copies of updates and apps you download to your Macs and iOS devices. These devices don't need to be configured; they automatically discover the server, and downloads go through the server, are stored there, then get passed on to the devices. 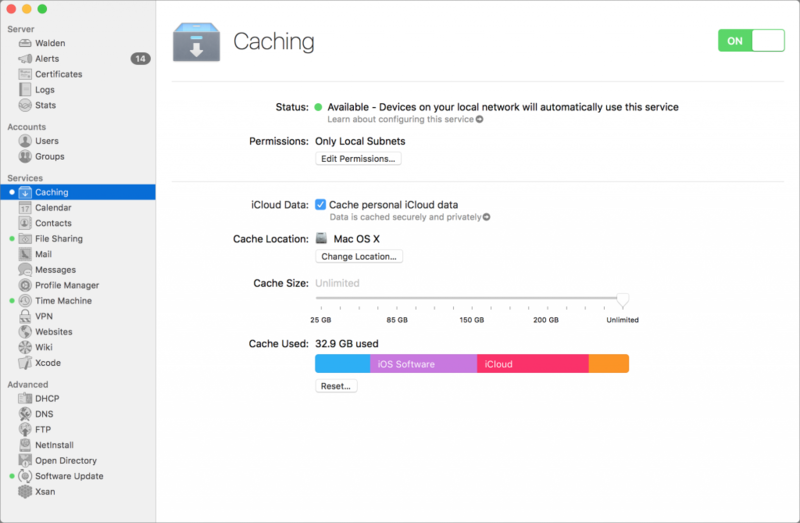 If you have more than one Mac or iOS device, any apps or updates you download will be cached, or stored on the server, so the other devices don't need to download them. This saves you time and bandwidth. However, for iOS devices, this only works with updates for the exact same model of a device; a cached update to iOS for your iPad won't work on your iPhone, and an iPhone 6s update won't work on an iPhone SE. All you need to do to turn this on is click "Caching" in the sidebar, and toggle the switch to On. You can also choose to cache iCloud Data, if you wish. At the bottom of the Caching pane, you choose how much space you want the cache to use. As you can see in the below image, my server is currently using 32.9 GB, and that's for two Macs and several iOS devices; the server has been running since El Capitan was released last fall. So you could set, say, 50 GB for caching, and be more than comfortable. 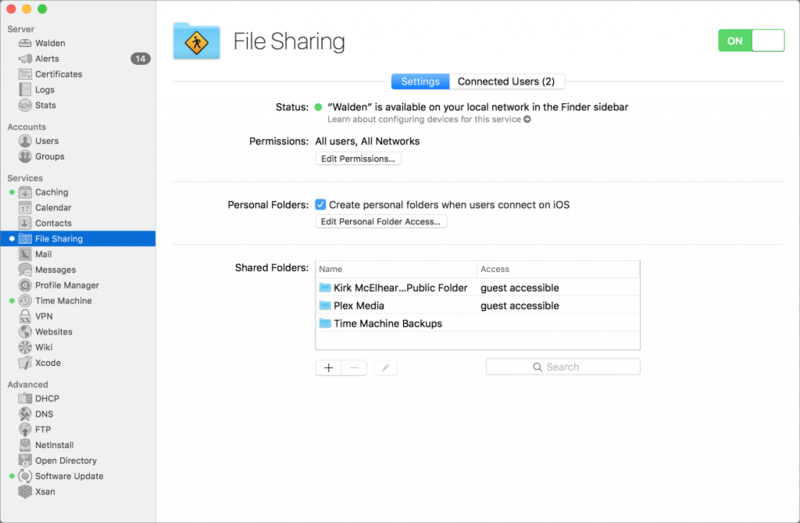 You may not need to use the File Sharing service, but if you want a centralized storage location for files on your network, you can activate this service. Click "File Sharing" in the sidebar, toggle the switch to On, and then add folders in the Shared Folders section. You can connect one or more external drives to your server, so you can have virtually unlimited storage for your files. I use it, among other things, for my video collection, using Plex. This software runs on my server, and allows me to view videos on my Apple TV, my Macs, my iOS devices, and even remotely. Just remember, any files that you store on the server need to be backed up. One backup with Intego Personal Backup is good; a second backup with Time Machine is even better. 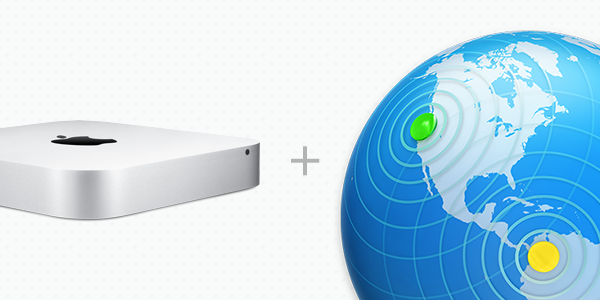 OS X Server lets you back up your Macs over your network to the server. 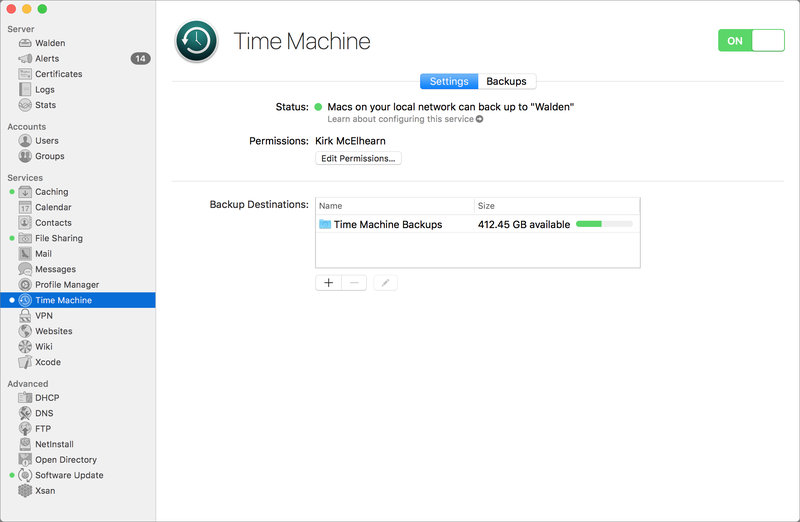 So if you have one or more laptops in your household, you can set them to back up automatically to Time Machine on the server, rather than worrying about connecting external hard drives to them for backups. Click "Time Machine" in the sidebar, toggle the switch to On, and then choose a destination. If you can, devote an entire external hard drive to Time Machine; the more space you provide to Time Machine, the more backups it will be able to store. On each of the Macs you want to back up, open the Time Machine pane of System Preferences, click Select Disk, and you'll see that the Mac automatically shows you the Time Machine disk on the server. Select it, and your backups will go to the server. You can manage the server's specific services using the Server app, but there are other management tasks you may need to perform, such as installing software updates or managing files. You can do this remotely using OS X's Screen Sharing. To do this, from another Mac, choose Go > Network in the Finder (or you can press and hold, Up—Command—K). Double-click the server, and then click "Share Screen." Enter the user name and password for the server, and you'll be able to see your server's screen as if you were in front of it. One thing I find useful is to use a display emulator on my server; it's a tiny dongle that I plug into the HDMI port, which changes the resolution so it's easier to see. If you don't use this, you can only view the server in one resolution in screen sharing. Once you've connected with Screen Sharing, you can manage such things as updates (through the Mac App Store app, if you haven't turned on automatic updates), and you can move files around, if you have more than one disk connected to the server. 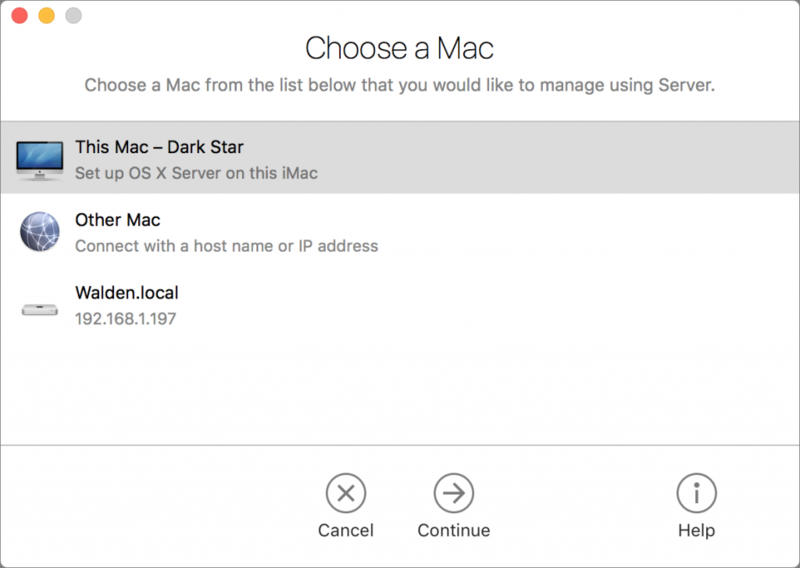 The idea of setting up a server may seem complicated, but with OS X it's quite simple. As you've seen above, there are some nifty ways you can use OS X Server, even taking advantage of an old Mac that's just gathering dust. Try it out! You may find that it makes your computing life a bit easier. This entry was posted in How To and tagged Mac, Mac OS X Server, OS X, server. Bookmark the permalink. Can you host your own personal web site, with downloadble files, site using this app on your Mac? in other words, could I? Yes, you can. I’ve never done it, but the Server app has a Websites tab where you turn on the built-in apache web server. You can then configure a number of things. A lot of this is pretty high level configuration, though, and you have to be sure that your server is always on line if you want people to access the website (rather than having, say, a private site). Yes you can but you do not need the Server app to make that work. A regular OSX is enough to do that. Turn on apache with launchctrl and have fun. But what do you do with a really old Mac that can only run Lion? Doorstop? Well, you can still run some software on it, but that’s pretty old. OS X Server won’t run on it, it requires 10.11. You might be able to find an old version of Server, but it’s probably not worth the hassle because of software that might not play well with it. Now that the Mac App Store no longer offers a version of OS X Server that will run on El Capitan (it would have to be Server 5.1.7) does anyone have a work-around? A bootleg version? A .dmg file?